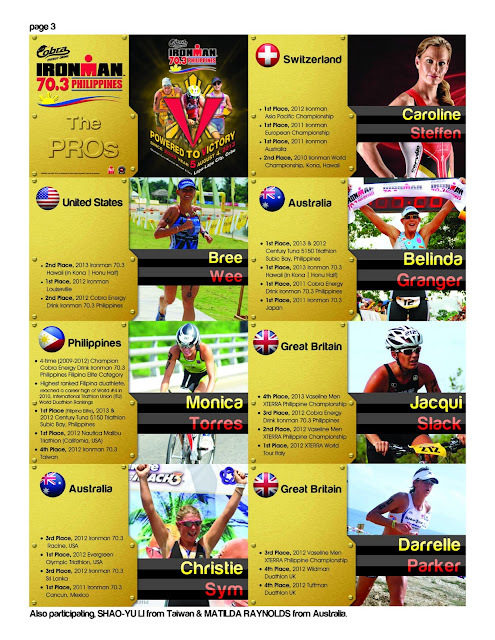 The Cobra Energy Drink Ironman 70.3 Philippines returns to Cebu, the country's number one tourist destination, as the province hosts its fifth edition as well as the Alaska Ironkids Triathlon on August 3 - 4, 2013. Already in its fifth year the Cobra Energy Drink Ironman 70.3 has become the biggest and best Ironman 70.3 race in this part of the world with over 2,000participants from 35 countries across six continents. All slots for the race were sold out four days after they were offered to the public and more than 600individuals are on the waiting list. The Cobra Energy Drink Ironman 70.3 Philippines starts with the 1.2-mile swim in open water at the beach of the Shangri-La's Mactan Resort & Spa in Mactan Island on August 4. The 56-mile bike ride will traverse four cities(LapuLapu, Mandaue, Cebu City and Talisay). The culminating 13.1-mile run will be at Punta Engano, Lapu-Lapu City. Race organizer Sunrise Events, Inc. expects the coming race to top the wildly successful races of the past four years confident that this year’s race will be its biggest and most exciting ever. Alaska Ironkids Triathlon will be held at the Shangri-La's Mactan Resort & Spa on August 3. It is the local junior version of the international Ironkids triathlon series. It is open to youngsters age 6 to 14 years old and aims to promote health among the young through proper nutrition and an active lifestyle. The Alaska Ironkids Triathlon has become an avenue for children to pursue their dreams and aspirations to become outstanding athletes and in the process develop positive values and adopt a healthy and active lifestyle. The Alaska IronKids Triathlon has grown from its humble beginning as a Sunday fun run for children to a national sporting event that has become a key training ground for the country’s aspiring athletes. More than just competition Alaska IronKids Triathlon offers an opportunity for families to spend quality time together. It has also created a community whose members aspire to become the best they can be both physically, emotionally and mentally. 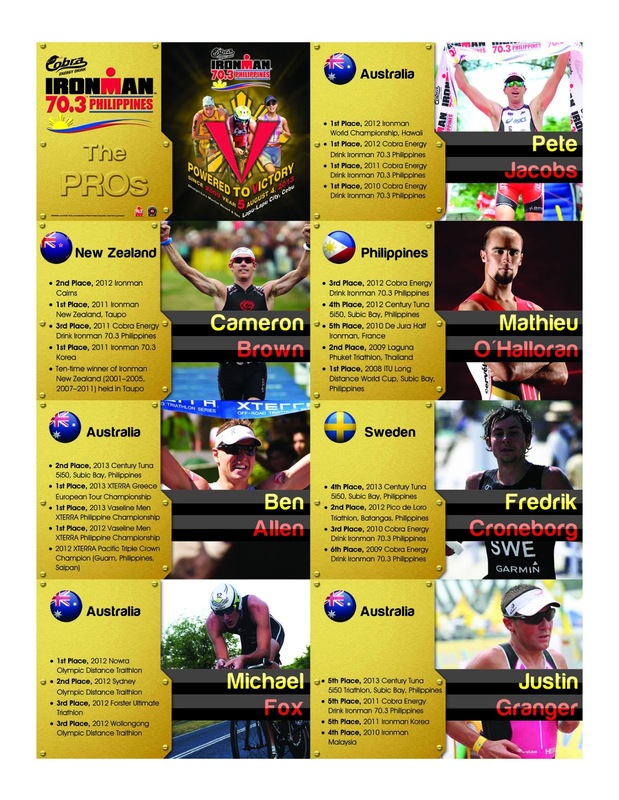 Leading the Cobra Energy Drink Ironman 70.3 Philippines are the professional triathletes notably three-time champion Pete Jacobs of Australia. Jacobs is a regular fixture of the Cobra Energy Drink Ironman 70.3 Philippines. He will gun for a fourth consecutive victory after winning the past three editions in 2010, 2011 and 2012. He will have his hands full against Cameron Brown of New Zealand and Alaska Team TBB's Mathieu O'Halloran who placed second and third in the 2012 race. Other male professionals to watch out for include Ben Allen Australia, Fredrik Cronberg of Sweden and Michael Murphy of Ireland. Defending women's champion Caroline Steffen of Alaska Team TBB returns to defend her crown. Her strongest challenge will come from 2011 champion and 2012 third placer Belinda Granger who is fresh from her triumph at the Century Tuna 5i50 Triathlon in Subic last June. Expected to compete for the crown are Bree Wee from the United States (who placed second last year), Alaska Team TBB's Christie Sym, and Jacqui Slack of Great Britain. 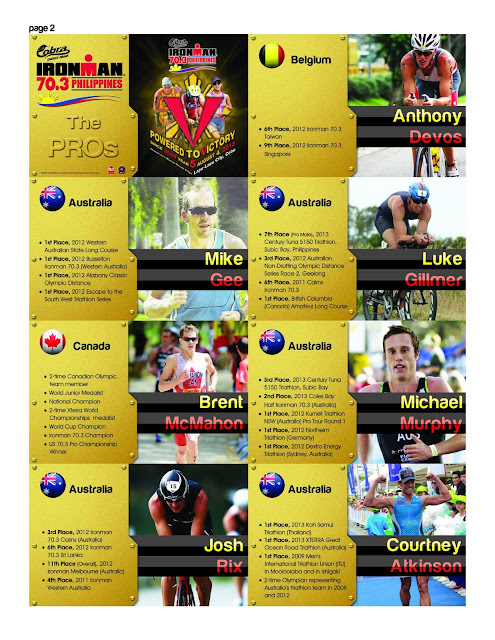 The Cobra Energy Drink Ironman 70.3 Philippines is a qualifier for the IronMan World Championships Las Vegas in Henderson, Nevada on September 8. The event is also sponsored by Alaska Milk Corporation, Aqua Sphere, Century Tuna, David's Salon, Devant, Gatorade, Globe Telecom, GU Energy Gel, Intercare, Kenneth Cobonpue, K-Swiss, LBC, Oakley, Prudential Guarantee, Safeguard, Suarez & Sons, Inc., and Timex. Official photographer is Finisher Pix while the host venue is Shangri-La's Mactan Resort & Spa. Media partners are MultiSport Magazine, The Philippine Star and Studio 23. Official hotel partners are BE Resorts, Crimson Resort & Spa, Movenpick Resort & Spa, Waterfront Airport Hotel & Casino Mactan, and Crown Regency Mactan. Special thanks to Department of Tourism, Province of Cebu, Mayors of Lapu-Lapu, Mandaue, Cebu, and Talisay cities. It is one of the country's most popular sporting events. A world class race it attracts thousands of both local and foreign participants yearly since its inaugural race in 2009.